Hjem » Sol & Solarium » Solariumskrem flasker » Black Raspberry 20x Ultra Dark 235 ml. Black Raspberry 20X Bronzer with DHA delivers a wave of deep, dark color while age defying Black Raspberry Extracts provides a rush of skin conditioning nourishment for a more youthful looking glow. 20X Dark Bronzing blend utilizes a complex of DHA and natural bronzers to dramatically darken skin after UV exposure for a deeper, darker longer-lasting tan. Age defying Black Raspberry extract enriched with vitamins A,C and E help hydrate and condition for younger looking skin. If you're craving dark color, don't settle for gold. 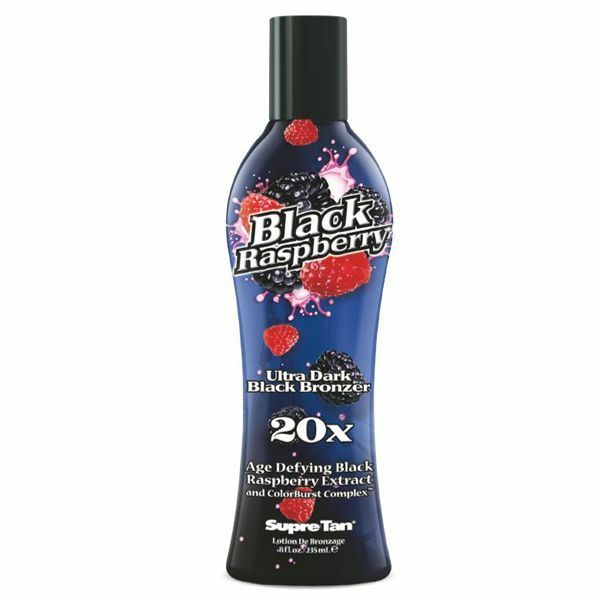 Shoot for skin as black as a black raspberry by applying Supre Tan Black Raspberry 20X Ultra Dark Black Bronzer before every tanning session. This luxurious bronzer is 20 times as strong as ordinary bronzing formulas, so it leads to remarkable results. The UV-stimulated bronzers help your skin manufacture as much melanin as possible in the shortest possible time, helping you get the dark results you want without over exposing your skin to ultraviolet. DHA extends the life of your color and helps to darken it to perfection following your session. Supre Tan Black Raspberry 20X Ultra Dark Black Bronzer is made with real black raspberry extracts, which supply the lovely, refreshing fragrance of the formula. The berries are also an excellent source of antioxidants, the nutrients that break down the reactive molecules found in ultraviolet energy that cause wrinkles to form. To combat tanning-related dryness, moisturizers are also added to the bronzer.